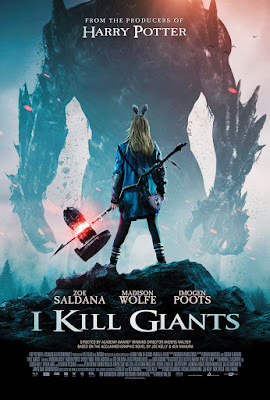 Film-Arcade.net: Official Trailer for the Upcoming Fantasy "I Kill Giants"
Official Trailer for the Upcoming Fantasy "I Kill Giants"
RLJ Entertainment recently send us information for their upcoming release "I Kill Giants". The film stars Zoe Saldana (Guardians of the Galaxy, Avatar), Imogen Poots ("Roadies," Green Room, That Awkward Moment, 28 Weeks Later), Madison Wolfe (The Conjuring 2, "True Detective"), and Sydney Wade (360, Una). "I Kill Giants" hits theaters and VOD on March 23rd. ​From producer Chris Columbus (Harry Potter and the Sorcerer’s Stone, Home Alone)​, I KILL GIANTS​ ​stars Zoe Saldana (Guardians of the Galaxy, Avatar), Imogen Poots ("Roadies," Green Room, That Awkward Moment, 28 Weeks Later), Madison Wolfe (The Conjuring 2, "True Detective"), and Sydney Wade (360, Una). The film ​was directed by the Academy Award winning writer/director of the short film Helium,​ ​Anders Walter, and ​was written and produced by Joe Kelly​ (Deadpool, Big Hero 6, Ben 10, Mega Man).